Plus we talked about where Henry thinks copywriting is going in the future (it doesn’t look good for some freelancers), how his Cross Fit habit is related to copywriting, and what he is doing to improve his own writing. You won’t want to miss this one. Click the play button below, or scroll down for a full transcript. Kira: What if you could hang out with seriously copywriters and other experts, ask them about their successes and failures, their work processes and their habits, then steal an idea to inspire your own work? 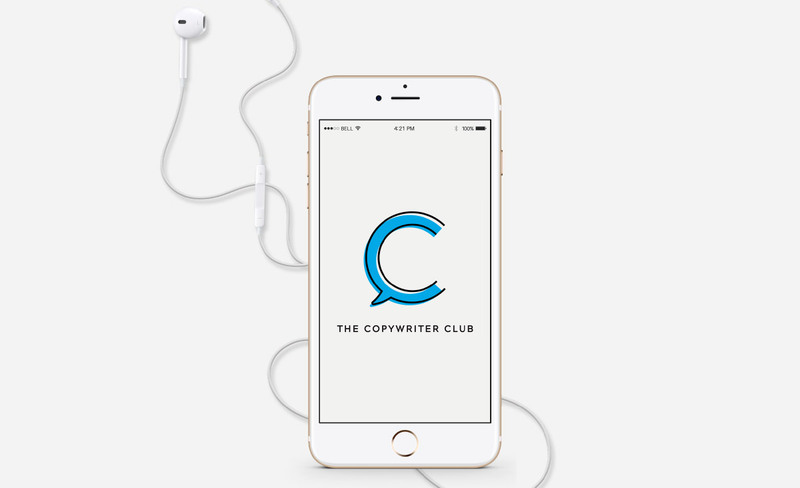 That’s what Rob and I do every week at the Copywriter Club Podcast. Rob: You’re invited to join the club for episode 66 as we chat with creative director and copy chief Henry Bingaman on working and writing in direct response, how much effort it takes to get a winning control, persuasion architecture, and applying systems thinking to the feedback process and how Crossfit makes him a better writer. Henry: Hey! Nice to be here. Rob: Hey, we’re glad to have you. Kira: Yeah, so Henry, a great place to start is with your path. I know you have a squiggly path, so where did you start? And where are you today? Henry: My kind of life path is just following the next interesting thing in front of me. (laughs) So, when I graduated in 2007 with a degree in fiction writing, which isn’t really a good degree for a job (laughs)… When I graduated, I went online and there was a job opening for flight attendants at United Airline. So I applied and started flying professionally for about a year. I was an international flight attendant, which was a lot of fun but it paid about $20,000 a year, and I was working up in First Class serving people that paid $20,000 for their seat, so I was a little jealous maybe? (laughs) But I had this writing ability. I’d been writing since I was early high school, just stories and whatnot. My dad actually owned a supplement company when I was growing up. He’d bought the AWAI six figure program at one point and he just gave it to me, he never really did anything with it, so he gave it to me and said, “Here, here’s a way you might be able to make money.” So that’s how I kind of discovered copywriting, and then I started writing on the side while I was flying and figured out I could make more money writing, staying at home and writing emails for people than I could flying. So I pretty much quit my job and started copywriting. Rob: So what were some of those first assignments that you took on, on the side, and how did you get them? Henry: Well, it was interesting… the first thing I did, I actually didn’t want to write for clients at first, I created my own product. The whole big thing back then was create an e-book and sell it on ClickBank or wherever. Henry: Because there wasn’t a market for it. Well, I did all that work and it never really sold. But that was really the first thing I did and then I started a creative writer’s desk, so I think it’s still online; it was Site Build It, if you guys remember Site Build It back in the day. Henry: So I started blogging and stuff on creative writing and then from there I went to… the way I got clients the first time was live events. So I went to AWAI’s Wealthy Web Writer event and I just started pitching ideas to Rebecca Matter who is one of the higher ups in that company—I think she’s a director. And she just bit on them. She’s like, sure! Send me a proposal! And I was like oh! Alright! And I just went back to my hotel room and I got out my computer and googled “how to write a proposal”! And I sent her a proposal and she goes, oh! Great! Send me an invoice and let’s get started! I was like oh! So I get my computer out again and I google, “How to write an invoice”. (laughs) I didn’t know anything about any of this. So that was my first client, and at the same time, my dad had some local friends in the health industry, so my first real sales letter was for an energy supplement for one of his friends. So I just used the contact I had and reached out to people and worked for really, really cheap and then used that to leverage more and more clients. Again, most of my big clients, I got at live events. You meet them in person. I know there’s a lot of people who do email prospecting and all that but I never had the skills, I guess, to ironically sell myself through email, but I could always talk somebody into hiring me when I’m sitting down face to face with them. Kira: So I want to definitely ask you about how you’re selling yourself at these live events but first, the flight attendant experience. What was one of the biggest lessons you took away from that time as a flight attendant that you use in business today? Henry: So I guess one of the cool things that you learn as a flight attendant is how to take really grumpy people and make them happy. Henry: Because honestly, people are having a bad day a lot of times on a flight and you have to-You’re locked in a plane with them, in this metal tube in the air for five or six hours sometimes. So if you can’t make them happy, it’s going to be miserable for everybody. So a lot of times, it’s just a free drink, or a conversation or something, but I probably learned how to reframe people’s problems and shift their state of mind to being happier, which I guess in copy, you shift their state of mind to being more receptive to your message. So I don’t know if that answers the question. That’s an interesting thing—there’s not a lot of skills-building in flight attending. But I guess that would be one of them. Interpersonal skills—dealing with people—is something you learn to do. Rob: You’re probably an expert at handing out hot towels, I would imagine, as well. Rob: So, let’s go back to Kira’s other question. Approaching people at conferences, or in meetings, talking them into hiring you… how does that work? Finding that connector, because I’m not really a connector like that but I find them, and then just you know, being present and sharing ideas and people will help you along the way as long as you’re genuine. Kira: Yeah, so this is getting kind of in the weeds, but were you intentional before these conferences? Did you know who you wanted to chat with, because you knew they were a connector or that, maybe they had a job? Or did it just happen naturally just because that’s how you show up in the world? Just ready to meet people and chat? Henry: I don’t think I knew of anybody. I don’t have an overarching grand scheme plan for my life, so I go to these events and I just see who there is interesting. And the interesting people to me are usually the people doing interesting things, like running companies or the other successful copywriters. So I just make it a point to talk to those people, partially because it’s good to connect with them and partially because they’re just interesting. Right? Do you want to talk to the person who isn’t doing anything and is sitting in the corner of the room? I mean, there’s always those people at these events, they’re super introverted and they sit in the back of the room and they don’t talk. And sometimes it’s interesting to talk to them because sometimes they actually are very interesting people, but it’s the people doing interesting things that I think I want to hang out with. So I just naturally connect with them. Rob: So I want to ask one more question about the idea of connecting with people. When you’re pitching ideas to people like Rebecca, or you know, a potential client, are you talking about ideas for their businesses or are you saying things like hey, Henry, I’d love to show you some ideas of how you might promote your turmeric supplement or those kinds of things? Or is it bigger than that? Kira: (laughs) There seems to be a theme here. Kira: Well, it’s interesting too because Jake Hoffberg, who writes for Agora Financial, was on the show and he said the same thing, essentially, always pitching new ideas and that’s how he has steady work. It’s just about pitching the ideas to the client and they’re like, yeah! Actually, we do want to do this! And we need a writer, so you’re the writer. So that seems to come up a couple of times in our conversations. I’m just wondering when you felt like you had kind of made it as a copywriter? And maybe this is the moment where you were able to leave your job as a flight attendant and you knew that you’d have steady work so you could make that jump? Henry: I did not know that I would have steady work when I left my job as a flight attendant. You know, I was 23 years old so I had no expenses, really. I was renting a room from my cousin for like, $300 a month, like I really just didn’t have huge expenses. I had a car payment and rent payment and that was pretty much it. And I moved back closer to my parents so I’d go over to their house for dinner three times a week. And I didn’t make, well, actually the first year, I did pretty well. I think the first year I went out freelancing, I made like thirty or forty thousand dollars, which—when you’re 23 and I’d pretty much doubled my income, right? And then I think the next year, I made like ten. So, there was definitely ups and downs. But I never really, I don’t know. When do you feel like you’ve made it? It’s such an interesting thing because I don’t think you should ever actually feel like you’ve made it. I mean, I’m pretty confident. I don’t have any financial insecurity now, like, right? I could get fired tomorrow and pick up another client. I guess in that sense, I feel like I’ve made it. But there’s always a next level to strive for. And so, I don’t know if that answers the question at all, but I never really felt like “I made it”. Rob: That goes with something that we heard you say at Copy Chief, I think; we heard you say that at one point, you wanted to be an a-list copywriter, but at some point you realized that there is no list. You just kind of get out there and work hard and eventually people start talking about you in the same conversations that they’re talking about some of the a-list copywriters—at least the people that we talk of as “a-list” copywriters. Henry: And then he went and rattled off the actual list, so… I stand corrected. There actually is an a-list. Rob: And John keeps the list. Rob: Yeah. So, tell us about what you’re doing today as creative director and copy chief at—I guess what used to be Natural Health Sherpa and is now Metabolic Living? Henry: Yeah, so we’re in the process of transitioning from Natural Health Sherpa to Metabolic Living. You know, we have multi-million dollar funnels running under the name Natural Health Sherpa, so you can’t just switch those off and switch it on in another company. It’s a long process. Hopefully early 2018, we’ll be able to finally flip the switch for good. But my basic role is you know, I’m chief in four different packages that are being done. Three of them are cross-sales, and one is a whole big funnel re-launch with, I don’t know if he wants me to say his name, but an a-list copywriter who I guess would be on John Carleton’s a-list. So right now, I’m not writing any copy, I’m just editing copy and along with the editing, there’s a lot of teaching. So one of the interesting things is, as a creative director/copy chief, you’re trying to get the knowledge and ideas that you have into somebody else’s head in a way that they can act on it, which is not an easy task. Like, teaching is not an easy thing. It’s not just sharing information; you have to assess how somebody’s hearing and using that information, right? Because you don’t necessarily hear things the way that they’re told to you, if that makes sense. Somebody could have one intention when they say something and it could be heard in a totally different way. Henry: So it’s a very interactive process. There’s a lot of learning from me AND them. So this is a fun time. It’s just pretty intense right now. Kira: Yeah, I want to hear more about this! So you are running a boot camp right now. I believe you said you brought on three new copywriters to your team and you are teaching them and helping them so that they can really jump into these projects and these packages. What are you teaching them first? What is most critical to you in the first stage, the first month? Henry: So all the copywriters I’ve brought on are somewhat experienced. I think they’ve been working for two to five years in some cases, so it’s not like I brought on somebody that I had to teach, here’s what copywriting is! But there are different architectures and structures in promotions that make them work. So I’m kind of going through that. So one of the big lessons I’m trying to teach is, “context is everything”. People take cues from the type of content that they’re consuming. So one of the problems I see, especially when we’re doing video copy, is people want to be too entertaining. So they’ll write a big dramatic, entertaining lead to their video sales letter, but you know, when you’re consuming entertaining content, what do you do? You sit back and just engage and relax, which is not a buying frame of mind. So you can use entertainment elements in your copy, but how do you create the context that they’re in a discovery-type frame of mind? Or a shopping type frame of mind? How do you get them from where they are to buying your product? And it’s not by giving them queues that say they’re being entertained. Does that make sense? Stuff like that that I’m trying to communicate. And then, giving actual examples and walking them through it and editing their copy WITH them, so one of the things we do is we work on a shared Google doc. So we have a call when we’re editing copy and you can see the writing happening in real time, whether it’s they’re writing it in real time so I can see what they’re doing or me rewriting some of their copy with them so they can see what I’m doing. Kira: Can you share this—I’m not sure if you can share this—but have you noticed any trends as far as mistakes that maybe all three of them are making or you’ve seen a bunch of copywriters make, other than the entertaining piece—that we’re trying to entertain and maybe we’re not within the context? Henry: Basically, there’s a bunch of mandatory copy blocks that you have to put in a certain order to get it to work. And the first one is what I call the paradigm shift. So the paradigm shift is, you’re taking a belief that someone has, and reframing it. So you’re literally changing the paradigm. One of the things that is hard for people to get is to do that dramatically enough without being over the top. Right? Like, how do you actually shift—help someone shift their perception? So that’s, I think, the biggest struggle that people have. Right? And that’s the lead of the promotion. It’s always the most important piece of copy, other than the close, maybe the headline. But if you don’t get them hooked right away, if you don’t create that drama, but along with drama, the interest in discovery. You’ve got to put them in the “oh, I’ve got to learn about this” mode. And I think that’s the hardest thing for people to get, so that’s what we spend a lot of time working on and rewriting and editing. Rob: So I’m putting you on the spot a little bit, but can we talk about an example of that paradigm shift and what makes a good paradigm shift, and what maybe is over the top or not sufficient? Henry: One of the—this isn’t even out yet so I don’t know if I should talk about it—but it’s the top of mine, because one of our copywriters was working on a cross-sell for our Metabolic Mastery club. You sell it like you sell a newsletter, so basically, you have a free work board that you give them, and then free report is a giveaway that they get when they join the club. So typical structure there. But this particular free report is about persistent organic pollutants, which are the toxins in like, DDT and the food chemicals and all that stuff. And I actually, so it’s interesting that these things, your body protects itself first by shuttling these pops into your fat cells, and then once they’re in your fat cells, they basically lock down the cell because your body doesn’t want to release that toxin back into it so it makes it incredibly hard to lose weight when you have too many pops in your body. And then when pops start losing weight, this is a funny stat—a 14% drop in body weight increases the amount of pops in your blood by 51%. Henry: You’ve heard that before, okay it’s something, it’s just—there’s nothing to sink your teeth into. So what we ended up doing is we rewrote it, and I really like this idea. Actually, why don’t I just pull up, I’ll read you the new lead. Okay, uh—“For just a moment, imagine a world where the air you breath and the water you drink is loaded with invisible calories. In this world, every breath and every sip of water inflates fat cells. Even the food is laced with hundreds of extra invisible calories. Would it surprise you to learn that almost seven in ten people in this world struggle to lose weight and keep it off? Of course not! Well that imaginary world and the real world we’re living in are disturbingly similar. Only in the real world, they are invisible calories—they’re much worse.” So that kind of lead is, you know, it’s creating a scenario of something that they can think about, right? “Oh my God, I’m eating these invisible calories! That’s the reason!” It’s not selling what isn’t; it’s giving them something that they can conceptualize. Rob: Yeah, and then you need to continue reading on to understand the concept like any good lead. Henry: Right. “So what are these invisible calories?” Well actually they’re called ‘obesigens’, and one of the worse obesigens is called ‘POPS’. So it’s that kind of stuff that you just walk them through it in that structure. Rob: Okay, that’s really cool. So you mentioned, you know, the different copy blocks and, hopefully, you know I’m not asking to give away something that you consider proprietary, but when you shared some of these things at Copy Chief, you know there were like ten or twelve, you know with escalations involved. Would you mind sharing some of the other copy blocks that are really critical for a great sales page? We don’t necessarily need to step through, you know, everything, but I found a few of these very interesting, and escalation seems to be a really big thing with a lot of the things you write. Henry: Yeah, escalations are just building up the problem and solution. Alright, so we’ll just run through them. The paradigm shift is that first thing, right? That, what’s changing? How is the world different than what they thought it was? Then there’s the guru backstory, which is just your, you know, your doctor, your expert’s hero story essentially. Then there’s something I call the shocking discovery, which is—it’s different then the paradigm shift, it’s kind of the backstory to the paradigm shift. It’s a shocking discovery or rediscovery; it’s your big proof element framed in a dramatic and compelling way, essentially. And then, there’s a chunk that I don’t think I talked about a lot, but it’s “forgiveness of sins”. So, explain to them why it’s not their fault, why their problem that they have or the solution that you have, whatever the problem is, is not their fault. There’s something else at work, right? You’re establishing an enemy, you’re setting up the context of why your previous solutions didn’t work, which also then sets up your product as the kind of hero on the white horse that can ride in. I think that one’s important, and I think a lot of people, they sprinkle it in here and there but they don’t actually sit down and put a concentrated block in explaining it. I think “mission statement’s” another one that a lot of people don’t spend a lot of time on. Give people a reason why you created a product. Between forgiveness of sins and the mission statement are your escalations, which are building up parts of the problem and parts of the solution. The thing that’s easy to misunderstand about escalations is that they don’t always go in one direction, right? It’s not the problem getting worse, and worse, and worse, and worse, right? You don’t want a story, that the emotional movement is all in one direction. Because you don’t want to sink them too far down into a pit that they feel like they can’t get out of. And you don’t always want to build it up—the solution—so much, that they think it’s all just hype and this is all just, you know, marketing BS and whatnot. So, changing escalations from problem solution, takeaway, that kind of stuff…creating emotional movement in different direction so it’s not one straight line. Kira: If there are any other ones that you want to share that are just key ones that people mess up, it’d be great to know. And then, you know, what is the best place? Where can we go to learn about all of these different elements because not everyone can jump into your boot camp and has access to what you’re teaching. Henry: I developed this over the course of a number of years. I—alright, I’ll tell a little backstory to this. I was walking with a copywriter named Jedd Canty, who’s, in my opinion, the best financial copywriter in the world today. You know, Clayton Makepeace left Weiss to go work with Jedd Canty; that’s how good Jedd is. Henry: And I was writing these promos, and they, you know, sometimes would work and sometimes they’d bomb. And then, Jed meanwhile was writing these promos that no matter what, were just friggin’ home runs. So what I originally did was just deconstructed all of his promos and I broke them down into, okay—what is this doing? Okay, what is this section doing? Alright, how’s it moving through? And I created this sheet based on, basically, his. And then when I started doing more health, I went into the health world and I looked at all the biggest promos that were out there. And just modified. So I mean, I built this on my own over the course of years. So, really what I say is, if you want to learn this stuff, go find the best promos today and break them down yourself. And really think about and analyze each part, and what is this section doing? And that’s how I created it; I think that’s how most people can create. I think when people just hand-copy promos, they’re kind of getting the structure but they might not be seeing it all. So I had originally I had seven stories; there’s now like sixteen of something, but I broke down what was in common between these things, right? So there’s a lot of promos out there you’ll find have the same type of story in the same place. So by breaking it down and analyzing it and giving it a name, like “the paradigm shift,” the “backstory”, the “shocking discovery”, “forgiveness of sins”, the “escalations”, the “surprise amplifications”; give it a name and see where it fits in other promos. So, you can’t just do it with one, you have to do it with multiple, over the course of probably a long time. But you can see what’s actually working, and actually discover the structure by analyzing what other people are doing. Rob: Yeah, I really like how you’re sharing this, and the focus on intentional learning, and intentional practice. And, that sort of leads me to the next question. You’re sort of walking through it already, but, how much effort goes into creating a winning control, you know? How many re-writes? How much editing? How much time? How much research? Henry: Well, the research is enormous, right? We actually have, I think, at Metabolic Living, we have ten full-time—or not full-time, but contract researchers that are actually doctors, and so we get enormous amounts of research. I think Aaron, one of the writers in this copy camp that we’re doing, he printed everything out and he had a binder with like two hundred pages of just the research that I sent him. Henry: Which is actually a term Marcella—it’s great because Marcella told me this all her first drafts, she just sends them to the client and says, this is a crappy first draft. It gets you off the hook for having to write perfect copy. But it gets you something that you can work with then. So once you have the crappy first draft done, we send that and we go through, and usually as the copy chief I’ll do an edit, or comment boxes here, like, this needs some work or we’re missing the logic on this, we’re missing the emotion on this, whatever it is. And I kind of have a checklist for that. Is there a logical component, is there an emotional component, does it support the theme, is it moving in an interesting direction, is it moving towards a sale, and what are the stakes? So take each block of copy and kind of run it through that filter and you’ll find out a lot of missing pieces. And then we do a collaborative edit, once we have a draft that we’re both fairly happy with. We get on Skype and open up a Google doc with the copy and you just read it. So, typically, the person that’s doing the collaborative edit there is the one that reads it instead of the writer, because you’re going to—it’s funny, a lot of times, when I’m reading my own copy, I’ll read over the same typo. I’ll read it the way I thought I meant to say it, or thought I said it, but I’ll read over a typo over and over again, so having someone else read your copy back to you, you can hear how it’s coming off in another voice, and then we just go block by block and edit each one. So that whole process takes a while. One of the big promos I did recently was called Metabolic Renewal. It’s actually launched on Facebook and it’s doing great now, so I’m excited for this holiday season to see what those sales do. But I hired Marcella Allison as the collaborative writer on that and I think we spent something like, 20 hours on Skype over the course of a week or two, just reading and reading and editing and reading and editing. So it’s an enormous amount of work to get these things done. But that’s—that’s immediate buy funnel. Some of the backend sales, or cross-sales, or stuff like that, it can take, you know, I think it was only like four hours with Amanda, who wrote that MMC copy, the Metabolic Mastery Club copy. So it depends on the importance of the project, and kind of the scope—what are you expecting it to do? Kira: Okay, I want to jump back into the research portion. You mentioned 200 pages and you kind of you know, outlined what you do, just, piecing together the outline of the page with the chunks of research, but like, what type of tools are you- are you just doing this in Google docs or do you have a special tool you’re using to lay out all of this information so it’s organized? Henry: Yeah, I wish I had something cool but it’s Word docs, Google docs, normal word processor. I haven’t found a really cool tool yet. I’ve tried a bunch of things. I used Scrivener for a while, which is actually a really cool writing thing, but it’s really hard to collaborate on it. The files just get too big and you can’t share them very well. So yeah, Word docs and Google docs is typically how we do it. Rob: Yeah, the back and forth collaboration is really interesting to me. You know, working with Marcella—that whole process feels like, for a lot of maybe younger copywriters, or more inexperienced copywriters, a little intimidating, right? Because you’re asking somebody to give you some very poignant and very helpful feedback and that could be painful at times you know, as they tear apart copy or say hey, this isn’t working, and you know, having to come up with new ideas on the spot, that could be difficult. Henry: I think that’s the wrong way to look at it, though. Like, it’s funny, all the big copywriters I know have zero shame in asking for help. Like, David Deutsch, he has no ego. You can’t have an ego with these things. So the confidence you have to have is, when talking to someone else, you’re going to be able to come up with an idea. Like, there’s no pressure to come up with a perfect idea. We sat—I sat on Skype with Amanda the other day, trying to like, well, I know this doesn’t look right, this part’s not right, what do you think we should put there? Well, I don’t know, what do you think we should put there? You can say I don’t know! It’s alright to say I don’t know. And then you can go back to other examples. The great thing about working with Marcella is she’s worked with Paris and David and Clayton and Mike Ward and all these board room controls. She’s seen every different situation, so she just goes to her swipe file and goes, Well, here’s how someone else did it. Henry: Here’s how Paris would handle this situation, here’s how David would handle this situation. I’ve only been doing this ten years, nine years I guess, so I’ve seen a lot, but I haven’t seen everything, and I think just having the humility to say I don’t know, and asking for help, and if you don’t know—if neither of you have an idea, just put it in a placeholder and say, I’m going to ask somebody else for help. Like, you don’t have to do it all yourself. You can’t know everything and you have to admit that yourself before you can do anything good. Rob: I like that advice. Kira: And I wonder, especially a lot of newer copywriters listen to this podcast, so if they’re listening and they’re like, that’s great! I’d love to have a copy chief, I’d love to have a collaborator, but I don’t even have a person to go to yet… I mean, of course there are different groups they could join, programs they could join, but at that point, do they just need to kind of figure it out on their own for a while and kind of do what you did and basically like, hack different pages and you know, find the trends before they can find the copy chief? Like, what do we do before we have a copy chief? Henry: If you’re getting clients at all, then your client is your copy chief, right? I think there’s something that I see a lot of copywriters do way too early in their career, is they write copy and they threaten the clients and have to run it word by word. Your client typically knows more than you. Because if he doesn’t, you don’t know enough. You can always find a mentor, even if it’s just a book or something. Like, just know that you don’t know, and don’t be afraid to ask and don’t be afraid to take feedback from everybody. Right? You can learn something from everybody. Everyone has some experience that can be valuable to you. And then, the more experience you get, the more experienced people you’ll be working with. You’ll move onto bigger clients who have more experience. So I think it’s just a gradual stepping stone thing where, take whatever resources you have, even if it’s just somebody’s opinion. Take it with a grain of salt, but always just listen to it. I think you can learn a lot from people. I think if you’re open, you can learn a lot from people. Kira: That’s great advice. So I want to pivot, and you mentioned a bunch of a-list copywriters and I know you’re well-connected and you have been open to other copywriters along the way; what would you say separates the great ones? And again, not necessarily a-list, but just great copywriters who you look up to and admire, from the ones that are maybe good, but they just haven’t reached that level. Have you noticed anything that those great copywriters share in common? Henry: So it’s really the ability to just grind. To put in the work. If you’re curious, and put in work, you’re going to be a good copywriter eventually. That’s just the way it goes. It’s so easy to out-work people in this industry that it’s disturbing. Like, I was a terrible copywriter very early, and I was very young in doing this, but I out-worked everybody and I just put in hours and I sent revision and revision and revision and I didn’t care if I got paid because I wanted to be good. You know, I’d have a thousand dollar contract, and I’d spend most of the month trying to get it perfect. Henry: And every time the client said something like, I just don’t know about this, I’d redo it. I wasn’t asking for more money to do it, I was just trying to get better. So I think it’s that drive. It’s the curiosity and the willingness to put in the work. Rob: So one of the things from a few people who listen to the podcast is we’re always talking about, you know, people’s successes and track records and how good they’ve become; I’m curious, as you look back on your career, Henry, are there some failures that sort of stick out that you’re maybe, you know, you look back and you think oh my gosh, I wish I hadn’t had that, or you know, I wish I’d been smart enough to avoid that? A failure that you can share? Henry: I’ve had a lot of failures. But I don’t regret any of them, if that makes sense. I think I learned something from every one of them. I think being able to learn from your failure is also a required skill in… basically, the world. (laughs) You want to do anything good in life, you’re going to fail initially. So I mean, I said earlier, the first year I did fairly well as a freelancer and the second year, I barely did anything. I struggled to get clients. I think I got too cocky way too early. Henry: I’m an over-confident person by nature, so I’m always having to check my ego. Which is good to know, right? It’s actually good—it’s a strength to have that confidence, but you should know that you’re not always right. Henry: So I got overconfident, too early, and I sold myself as more than I was early on, I think, to a couple of clients, and then when I couldn’t basically follow up with it, nobody would hire me for a while. (laughs) So I was doing these $200 articles and these tiny little projects, just scraping by. We’d run and get my credit cards and it was just terrible times there, in the beginning. It’s another thing you have to grit through; everybody’s going to have that struggle to one degree or another early on in their career. And just know that the failures are lessons, they’re not actually failures. You know, the first sales letter I did, you know, I think it got zero sales. (laughs) Like literally, not a single person bought. Henry: You know, and that’s embarrassing because I sold that letter for $1500. (laughs) They never made that back! So I did a ton of extra work for him like, did all his website copy and just, makeup copy basically for how bad it was. I worked for Money Map Press; I was one of the senior copywriters for about five years, and the first promo I did there was the—it was about super-dividends and it bombed! Horribly. I wasn’t sure they were going to keep me on after that. (laughs) But then, the next one did like four million dollars. So you just have to accept that you’re not going to be perfect and these failures are going to happen. And you know, the struggle is the way you get good at things, and failure is part of that. I think it’s something that people have to learn to embrace, not just accept. You have embrace your failures and go back and figure out why, and use it as a lesson. Rob: And how often today do you hit a home run versus, you know, base hits or, you know, duds? Henry: I did one promo earlier this year that really didn’t work that well. It beat the control but not by enough to make it worth running. And then the next one I did after that was the biggest promo launch in company history, so….I don’t know. I hit mostly triples, I’d say. But every once in a while you strike out. If you’re trying interesting ideas you’re going to strike out eventually. Some, some ideas just aren’t going to connect. Rob: Yeah, I think that’s really the important thing is keep trying new things, you know, don’t necessarily you know do the same thing over and over, and keep trying and keep learning, and you know eventually the home runs do come. But, yeah, I mean I’ve written pages when I’m surprised when they don’t perform very well; I think, “you know I thought I did everything right”, but for whatever reason it didn’t work, and those are sometimes are a little bit hard to walk away from. Henry: Sure. It’s one of the mistakes that I always made at Money Map; when I did a promo that didn’t quite work the way we thought it would, we’d just spend forever trying to tweak it and make it work. If there was a sign of life, I’d just—instead of moving on to another one, we’d tweak it. And you know, I think sophisticated clients expect strike-outs every once in a while. They don’t bank on everything working. So if, if you’re not striking-out, you’re not trying and the clients know that. So, I think, if you’re working with good clients, the misses become irrelevant, because you just get back at the plate, take another swing. Kira: Alright, I’m going to shift gears a bit, but I’d love to hear from you just about the future of copywriter, and I know that’s a really big question, but you know, where do you see copywriting going as far as what’s coming up over the next few years? Henry: But being a part of that team is just going to make it increasingly hard. You know, copy’s getting so good these days; if you look at some of the stuff the Agora divisions are putting out, some of the stuff in the health world—it’s just sharp copywriters doing really good work, and they’re working as a team. I think it’s going to be really hard to go against the team, so I think more and more people are going to end up joining up long term with basically one client, and working in that collaborative environment. Rob: And this is something that Brian Kurtz has been talking a lot about over the last year or two, you know that more and more companies need to find copywriters that learn their businesses as well as the business owners, in order to create, you know, copy that really resonates with their clients. Henry: …Made direct response like measurable, and mainstream. And so, that’s why I think you could be a freelancer before, because it was not something that was that visible. Now it’s mainstream and even the bigger companies are starting to do it, and it’s widely accepted, and that’s making it much more competitive. There’s more copywriters now than ever. There’s also more copy needed. Like, it’s easier now to get started because much smaller clients are starting to use real direct-response copy. So there’s that springboard for freelancers, but you know, to be the top tier now, I think it’s all shifting to teams. I think Kurtz, Brian Kurtz, is right about that. Rob: So, I actually—I want to know about Cross Fit. Henry, I know you’re not just writing about health, but you’re actively, you know, pursuing a relatively healthy lifestyle; at least you try, you experiment. How does Cross Fit fit into your life, and does it make you a better copywriter? Henry: Well I mean, physical fitness is just important for everything. Like you can’t be a good copywriter if your brain’s working at half speed, and you know, you can’t get outta your chair. It’s just—I don’t know that it’s Cross Fit itself, is directly related, but like, I guess you could say it’s related in that, it’s the same thing: you have to be able to endure the pain. You have to be able to get in there and do the work, and that’s how the successes come. So, I don’t know. I think a lot of copywriters I know that are really successful are also workout junkies. I think it’s just personality type more than the actual correlation there, but yeah. I don’t know. It’s been fun. I’m also a Cross Fit coach, so, it helps to learn to teach. Because what we do in copy is basically, half of it’s teaching. Henry:...and they’ll get it. Right? So you just have to learn that there’s different ways to talk to people. And I think that, you can translate that skill into a lot of copy. Kira: Alright, so Henry, I want to know what’s coming up for you, you know, you said you follow what’s interesting, and you’re building a team. A lot of time and energy is going into that. So, what are you focused on in the new year? What do you want to accomplish? Henry: So I mean, what’s interesting to me right now, is learning how to teach better. It’s working with this group; it’s one of those things, I know, you can tell I say “um” a lot, I stutter when I’m talking, I don’t have the best teaching style yet. I’m learning more about teaching and I think that’s going to be a key part building out this team, and making it efficient and effective. And really, ‘because i want people to be successful. So I want to learn how I can help people to be more successful. So I guess that’s kind of my—because that’ll help me be more successful. That’s kind of my focus for the next year. Kira: Yeah and one final question, just—how do you learn how to teach better? I mean is it purely like finding the right books, or through mentorship? How are you improving that part of your business? Henry: So how do you get that same concept into somebody else who has a whole different life perspective and experience, and get the same result? It’s kind of a fun puzzle to try and solve, and I’m enjoying doing it. It’s also very challenging. Henry: Yeah, if you can tolerate it, sure! Rob: This has been fantastic. You know, especially stepping through, you know, the boxes of the copy blocks that you put, you know, on your sales pages, I think it’s very different from a lot of the things in the past on the podcast, and it could be really helpful fro someone who really struggles to piece together a sales page, so I really appreciate you sharing that and you know, some of the logic behind the different blocks and why you do them. Kira: Yeah; Henry, can you just create a course based off this boot camp that you’re running through, so we can all experience your teachings? Henry: …because I don’t have to go through it every time, but it’s only going to be for people that actually come work for Metabolic Living. Rob: Yeah, listen—listen to what we said at the first of the podcasts about approaching you at conferences so that you can get access to this stuff. Kira: Right! Right. Alright, thank you Henry! We appreciate it. Rob: Hey, thanks a lot Henry. Henry: Alright guys, it’s been fun.